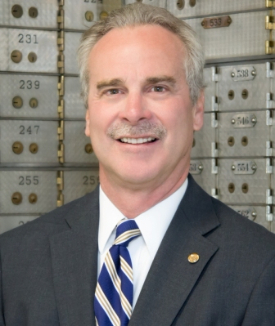 Steve Slack held multiple leadership roles at large commercial banks before returning to Crystal Lake in 1994 to help lead Home State Bank as their Executive Vice President & Chief Lending Officer. In 2001, Mr. Slack became President and Chief Executive Officer at Home State Bank, the community bank that he was a customer of during his childhood. Mr. Slack graduated with a Bachelor of Science degree from the University of South Carolina. Additionally, he earned a Master of Business Administration from the University of Texas at Austin and his Certified Public Accountant designation from the University of Illinois. Throughout his tenure at Home State, Mr. Slack has been involved in serving organizations like United Way of Greater McHenry County, Raue Center for the Arts, and Leadership Greater McHenry County. He was recently a volunteer coach for the Immanuel Lutheran School's basketball team and currently as the Finance Director at the Crystal Lake Country Club. Mr. Slack has lived a majority of his life in the Crystal Lake area with his wife Leeann and four boys. When Mr. Slack isn't busy leading the strategic direction of the Bank, he likes to use his spare time reading and golfing.